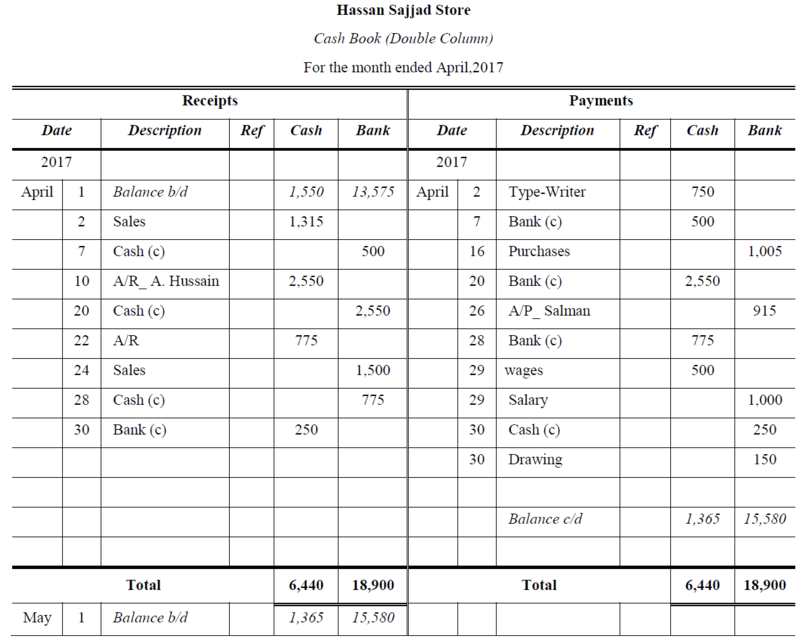 On April 1, 2017, Hassan Sajjad Store Cash Book showed debit balances of Cash Rs. 1,550 and Bank Rs. 13,575. During the month of April following business was transacted. 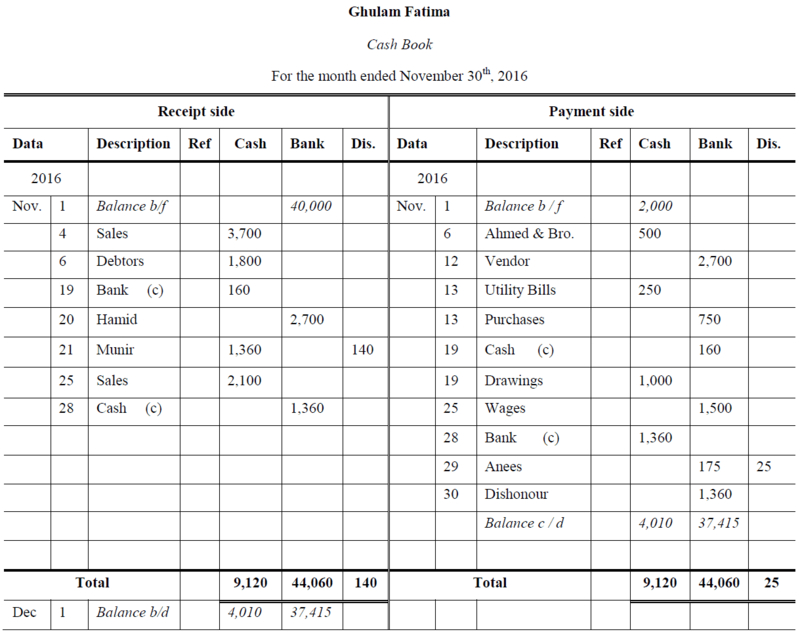 You are required to prepare Cash Book? 02 Purchased Office Type-Writer for Cash Rs. 750; Cash Sales Rs. 1,315. 07 Deposited Cash Rs. 500 to bank. 10 Received from A. Hussain a check for Rs. 2,550 in part payment of his account (not deposited). 16 Paid by check for merchandise purchased worth Rs. 1,005. 20 Deposited into Bank the check received from A. Hussain. 22 Received from customer a check for Rs. 775 in full settlement of his accounts (not deposited). 24 Sold merchandise to sweet Bros. for Rs 1,500 who paid by check which was deposited into bank. 26 Paid creditor a Salman Rs. 915 by check. 28 Deposited into Bank the check of customer of worth Rs. 775 was dated 22nd April. 29 Paid wages by cash Rs. 500 and salary Rs. 1,000 by bank. 30 Drew from Bank for Office use Rs. 250 and Personal use Rs. 150. >> Use Three Column Cash Book Format for practicing Three Column Cash Book Problems and Solutions. 1 Cash balance (Cr) Rs. 2,000; Bank balance Rs. 40,000. 4 Cash sales Rs. 3,700; Credit sales Rs. 1,800 would be received at near future. 6 Paid Ahmed & Bros. by cash Rs. 500; Received cash by debtors Rs. 1,800. 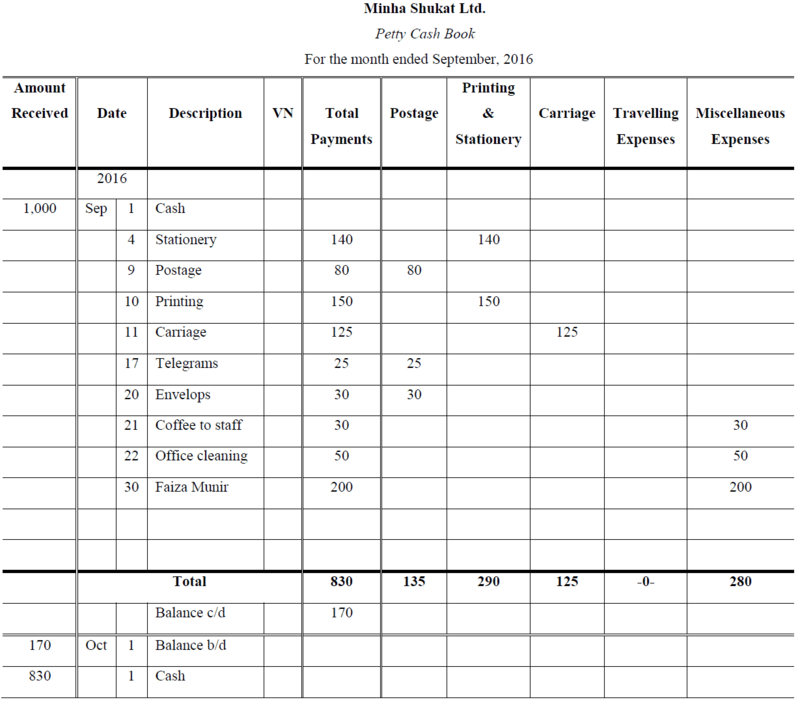 12 Paid to vendor by means of check worth Rs. 2,700. 13 Paid Utility bills in cash Rs. 250; Bought goods by check Rs. 750. 19 Drew from Bank for office use Rs. 160; Personal withdrawal of cash Rs. 1,000. 20 Received a check from Hamid Rs. 2,700 and deposited into the bank. 21 Received by check from Munir Rs. 1,360; Discount Rs. 140 (not deposited). 25 Cash sales Rs. 2,100; Paid wages by bank Rs. 1,500. 28 Deposited Munir’s check into bank. 29 Payment by check to Anees for Rs. 175; Discount received Rs. 25. 30 Munir’s check has been dishonored and return by bank. >> Read Three Column Cash Book theory related issues and questions. >> Do Practice Cash book MCQs for conceptual and theoretical understanding. 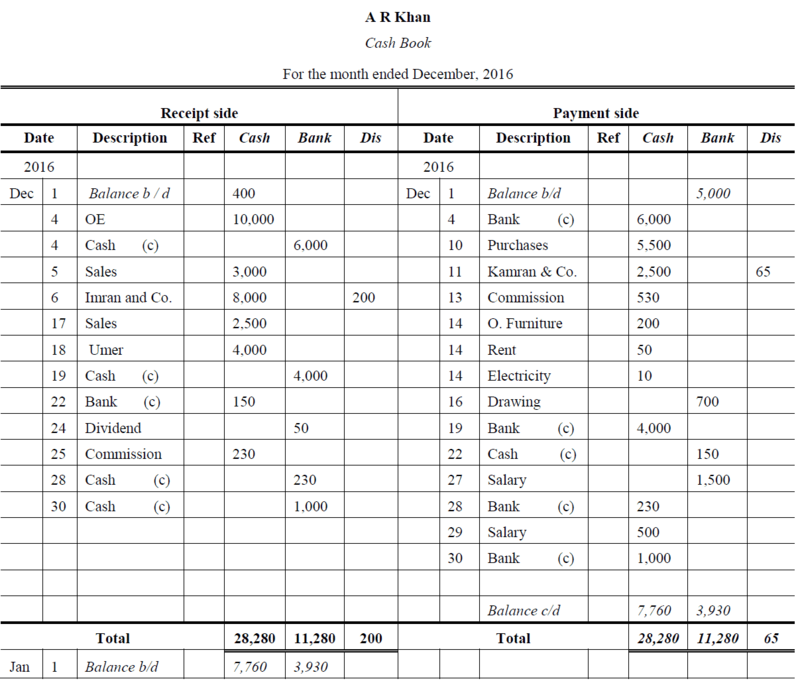 Prepare Petty Cash Book on imprest system from the following particulars for Minha Shukat Ltd.
>> Read More Petty Cash Book.